I really, really wish I could get in a time machine and travel back to observe some Clovis people of Texas like the ones written about in 11,000 Years Lost by Peni R. Griffin, (2004, 307 pages.) Because the past they lived in was so distant, there is so little we know about them. I have often dreamed of being able to hear what early human’s language sounded like. After reading this richly imagined book, I have another question: what did their songs sound like? The story is about eleven-year old Esther, who becomes fascinated with an archeological dig that is going on in her hometown. She is allowed to help out at the site, bringing drinks, and doing small jobs for the workers. The kind leader of the dig, Dr. Durham, explains as much as she can to Esther about the artifacts they are finding, and what is known about Clovis society. One day Esther attempts to help out Dr. Durham by trying to find the remains of a Clovis campfire. Esther wanders in the woods, imagining this past society she has heard so much about, and suddenly she is seeing the land differently. There are two translucent layers– the familiar one, and superimposed upon it an unfamiliar one with different trees. Esther walks through a couple pine trees that weren’t there a moment ago, and then the familiar world disappears completely, and she is way, way back in time, 11,000 years. It’s a magical moment. I love this image of a portal to time travel: two layers that gradually resolve into one. This is one of the best treatments of the transition from the present to journeying back in time that I have read in a time travel story. When I was about eleven years old my family took some double exposures with our Kodak Instamatic camera. These accidents turned out to be pure serendipity–two images coming together in a wholly unexpected way. That’s sort of how I picture these shimmering layers Griffin writes about. Esther has to survive in the tribe of about twenty people she meets there until she can find her way back home. Like the other book reviewed in this blog by Peni R. Griffin, Switching Well, this book is rich in period details. I want to give a shout-out here to Ms. Griffin for taking the time to do the research that makes this kind of detail possible. Thank you for your hours upon hours of work. What am I good at? What am I good for? Who do I love? Who loves me? How should I behave? These are the questions that all people have to answer for themselves, in every age, under every circumstance. She does a great job of answering them for the characters in this story. Ms. Griffin’s tale has rich character development and is full of emotion–my kind of story. The book was about how the people survived, mostly focused on their quest for food, but also on the emotional relationships between the characters. It was a long book, the psychological stuff was kind of complex, and while I think older readers will love it, I think it might actually go over the head of younger middle grade readers. But I now count it among my top ten all time favorite time travel stories. 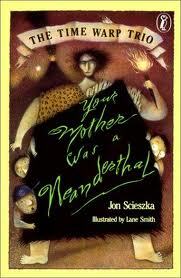 I’ve read enough Jon Scieszka to know I’d be doing a complete 180 from the first book reviewed in this post with his Time Warp Trio book Your Mother was a Neanderthal, (1993, 76 pages). For starters, it’s a couple hundred pages shorter. Like Scieszka’s Da Wild, Da Crazy, Da Vinci reviewed in an earlier post of this blog, it’s sprinkled with humorous black and white drawings, this time by award-winning illustrator Lane Smith. In this caper, friends Joe, Sam, and Fred go back to the Stone Age. They plan carefully and put supplies for their trip in their pockets, including pens, can openers, potato peelers, scissors, thermometers, buckles, a slingshot, and a barbecue fork. Too bad when they arrive back in time they have nothing and are completely naked! The three hastily make clothes out of leaves.They meet a group of Neanderthal guys, or cavemen, who aren’t very bright, as well as a group of more intelligent cavewomen, perhaps Cro-Magnons. Scieszka packed the story with great dialogue, action, and enormous hairy beasts. It’s LOL funny. At the end there is a small surprise revealed re the blue notebook they use for their time travel adventures. Recommended for those who want a light, quick time travel read. I am jumping on the Marvelous Middle-Grade Monday bandwagon. MMGM is the brainchild of Shannon Messenger. You can find links to other bloggers who review middle grade books on Mondays at her blog ramblingsofawannabescribe.blogspot.com. I will try to post the first and third Mondays of the month. Wish me luck! This entry was posted in Book reviews and tagged 11000 years lost, Book reviews, Books, Jon Scieszka, middle grade fiction, Peni Griffin, time travel stories, Your Mother was a Neanderthal. Bookmark the permalink. I love time travel! So glad I found your blog. 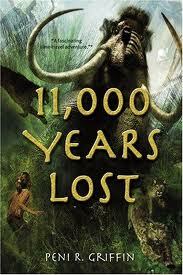 I’ve seen 11,000 Years Lost but haven’t read it yet, although I’m a huge fan of Switching Well. Voices After Midnight is my favorite time-travel novel of all time! Welcome to MMGM. I’ll be back. Didn’t know 11,000 Years Lost was a movie! I’ll have to see that. I’m so glad Voices After Midnight is your favorite time travel novel. Now I’ll really look forward to reading it! No, no! I meant I’d seen the actual book (as in: I’ve shelved it in the bookstore), but hadn’t yet gotten around to reading it. Although, come to think of, it might make a good movie.